Powerhouse Yoga combines the best of Pilates and yoga into a series of dynamic full-body fusion workouts designed to activate and strengthen your “powerhouse.” Your “powerhouse” is the collective group of your abdominal, low back, and pelvic muscles that create the foundation for all movement. You will target and activate these muscles in each dynamic full-body workout. Activating your powerhouse can lead to improved posture, body alignment, and stability, making it the perfect complement to a healthy, alignment-based yoga practice. Perfect for intermediate yogis, this plan includes five 30-60 minute yoga and Pilates fusion workouts. It is ideal for those who want to harness deeper core awareness and activation to enhance their daily yoga practice. You will learn to engage, strengthen, and stabilize core muscles, which supports balancing postures, inversions, and a variety of other yoga poses. The techniques and alignment taught in this plan will help you unlock newfound strength, develop heightened control over your core muscles, and build an understanding the most connected part of your body, the powerhouse. Kristin McGee is a celebrity yoga and Pilates instructor from New York City. 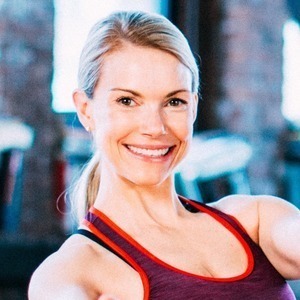 Her experience with fitness dates back to 1997 when she became a Pilates, yoga, and fitness teacher after graduating NYU's Tisch School of the Arts. Kristin teaches all over Manhattan at top gyms and yoga studios as well as privately. She has served as host and choreographer for MTV's Pilates and yoga DVDs, and has also appeared on Fox 5 Good Day New York, CBS Today Show, the Jay Leno Show, Good Morning America and advertisements for Lady's Footlocker, Budweiser and Barclays. She has worked as a contributing editor, consultant and/or model for several national magazines, including Women’s Health, Shape, Fitness, Self, Pilates Style and Fit Yoga. After Kristin's success with MTV, she produced her own DVD series, which includes Kristin McGee’s Power Yoga and Kristin McGee’s Bendigirl Yoga, the first ever yoga program designed specifically for preteens. Most recently, Kristin shot Pilates for Beginners (named a top DVD pick by Shape magazine) and Weight Loss Pilates for Acacia Media. Kristin is also the Pilates expert for Home Shopping Network's Pilates Power Gym. She also starred on 30 Rock as Kaitlin, the yogaerobics instructor and fiancee to Floyd. This is a 16-minute preview of Kristin McGee's "Powerhouse Yoga" series. Wake up your core with essential Pilates moves for your yoga practice. No props are needed, but you may want a strap or blocks for stretches and standing postures. Get your heart rate up and ignite your core! Today's class highlights your obliques and twisting actions which are crucial to everyday movements.